Amla berry, or Amalaki commonly known as “Indian Gooseberry,” is a small, greenish fruit with a tart, sour taste. It is a source of whole food Vitamin C and Fiber. Cultivated in India for thousands of years, the fruit has been used in Traditional Ayurvedic Medicine as rejuvenating tonic beneficial for balancing the body and for aiding daily, gentle cleansing and detoxification. It is one of the ingredients in Triphala, Ayurveda’s most common herbal formulas. In traditional Ayurveda, Amla is sattvic in nature and is therefore a good general tonic for daily use. According to the energetic principles of Ayurveda, Amla is sour, sweet, pungent, bitter and astringent in the Rasa taste energy, cooling in action according to Virya and balancing for all doshas, particularly for Pitta constitutions in need of cooling energy. 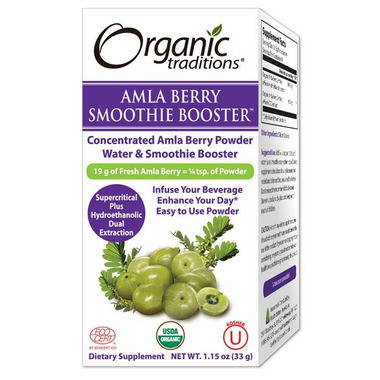 Amla berry powder has a naturally tart, citrus like taste. While it can be used as an everyday tonic, it is particularly beneficial during cold and flu season and in times of stress due to its high content of Vitamin C.
As one of nature’s most revered botanticals, Amla Berry has been used for centuries as an important herbal remedy in Ayurvedic Medicine. Organic Traditions' proprietary full spectrum process gently extracts the full array of phytonutrients using a combination of supercritical and hydro-ethanolic extraction, offering the complete signature of the herb in its most potent and pure form. No harsh chemicals, solvents or high heat are used in the process ensuring optimal stability and the complete profile of protective therapeutic benefits as nature intended. This free-flowing soluble powder can be taken as is or added to any beverage, smoothie or recipe. Extremely concentrated. Use ⅛-¼ teaspoon. For use as a general, daily tonic: Use ⅛-¼ of a teaspoon once or twice daily. Sensitive individuals may want to start with only 1/8th of a teaspoon once daily and assess the results. How to Use In The Kitchen And On The Go: While most supercritical extracts are only available in a liquid form, Organic Traditions proprietary technology offers this dual-extraction in an easy to use, semi-soluble, free flowing powder. The powder is extremely concentrated. Adjust the amount for your needs and for each unique application. 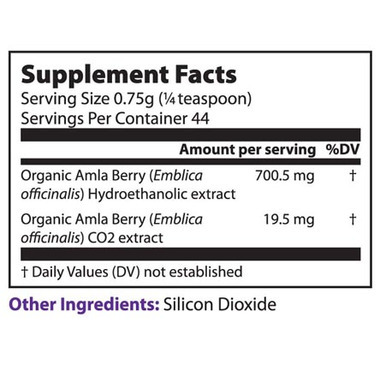 ⅛-¼ of a teaspoon of Full Spectrum Amla powder can be added to 8-16 oz. water, coconut water, any beverage, smoothie or recipe. Make warm tea-like infusions by adding the powder to warm water (not boiling) and a natural sweetener of your choice such as Organic Traditions Yacon Syrup or Organic Traditions Coconut Palm Sugar. A cup of Amla tea (do not use hot or boiling water – lukewarm water is fine) with Yacon or Organic Traditions Coconut Palm Sugar is wonderful if you are feeling run down or have a cold and flu. It is also excellent as a daily tonic. You can combine it with Organic Traditions Full Spectrum Ginger powder. Add Full spectrum Amla for example to a water bottle with a teaspoon of Organic Traditions Yacon Syrup when you are on the go to create a refreshing and uplifting drink. Simply shake and enjoy. Please note that Amla has a very tart and sour taste and so you may want to combine it with a sweetener of your choice. Lastly, make a mouth and gum rinse or gargle by adding ⅛ of a teaspoon to ½ cup of warm water. For a gargle, Amla combines well with Organic Traditions Full Spectrum Cinnamon or Ginger. I really like this stuff. Has a very mild, tart taste. Amla is incredibly good for you, but it tastes terrible in it's natural form, so I take this instead.